Consumer World is a public service, non-commercial* guide with over 2000 of the most useful consumer resources. On June 19, Samsung introduced its largest tablet computer yet, the Samsung Galaxy Tab 10.1, and they provided Consumer World with a review unit to test in advance. In three words, wow, wow, wow. 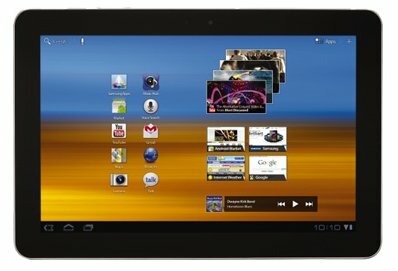 MrConsumer has never used a tablet computer before, nor any device that runs on the Android operating system, so there was a little bit of a learning curve. Like how to turn the thing on. After holding in the power button for three seconds, you get an orange screen with a lock symbol in a circle. I pressed and pressed that darn lock symbol, but nothing happened. Finally, I slid the lock a few inches over, and voila, the home screen appeared. After a pretty easy set up routine, including getting the unit to hitch up to my router, we were in business. You do have to download flash 10.3 (yes, unlike the iPads, Samsung does flash), and also obtain the driver to be able to connect the 10.1 to your computer via USB. This model is a 16-gig wi-fi only version, but several cell companies will be offering it with cellular wireless connectivity. I got the full 20 megabits per second download speed sent from my cable modem via wi-fi. Couple that with the unit's speedy dual core processor and Android 3.1 operating system, web pages come up with only a few seconds wait, and apps tend to load instantly. I cannot photograph how sharp and brilliant the 10.1-inch, 1280 x 800 screen is, but it is sensational (and higher resolution than iPad-2). The New York Times website, for example, has dark crisp text on a brilliant white background and I only have brightness on about 40%. (This is compared to slightly fuzzy text on an iPad-2). [Note: many sites come up in mobile mode view, not giving you the full site you may used to seeing on your desktop or laptop. That default has a hidden switch in the 10.1, but once toggled, regular sites can be viewed normally.) And the default font is perfect reading size. If you want it bigger, you easily change the default font size. Or, on any particular page, you can use two fingers to enlarge/stretch the image. And the text instantly crisps up to the new size. The unit comes with a variety of applications, including a browser, apps for maps, GPS navigation, email, gmail, picture gallery, You Tube, Android Market (to get more apps), news, and Office-like programs for word processing, spreadsheet, and powerpoint. I added apps for Kindle, Skype, and Overdrive (to borrow ebooks from libraries). What I could not add were apps for Google Voice, TextFree (and other things), which let users make free phone calls and send free text messages even without a cellular connection. Grrrr. These two apps do exist for Android devices, but they are missing from Samsung's version of Android Market, and uninstallable from the web version of Android Market. How frustrating to find an app you want, but then to see this warning "your device is incompatible with this app." A spokesperson for Samsung says that "Wi-Fi only devices do not have the ability to make phone calls." Well, that is not entirely true. MrConsumer was not deterred. He tried everything to enable this tablet to make free calls and texts. After many failed attempts, he found two apps that worked. GrooVe IP, for $3.99 ($1.99 when on sale at Amazon), is the app to buy to magically make free calls to landlines through Google Voice. And Heywire (a free app) assigns you a phone number (not local) so you can send and receive free text messages. One can also download a version of Google Voice which was made for the Motorola XOOM, and it will allow you to text on the 10.1 using your Google Voice phone number. Using the browser that comes with the 10.1 is simple. You just touch the address bar, and use the large pop up keyboard that fills the bottom half of the screen. With each key tapped, you feel a slight vibration to indicate the key has been pressed. This tactile feedback makes it almost feel like you are depressing the key slightly. Virtual keyboards are not really springy, so they are better for short amounts of typing only. There is no delete button on the keyboard, so you cannot delete entries forwards, only backwards with the backspace key. You scroll down the browser screen by using your finger to slide up or down. Flicking the browser upwards or downwards does not really work. You can, however, flick the pages of a book with your finger in the free Kindle app. And you can pinch to make pictures smaller in the photo gallery. If you don't like using a keyboard all the time, the 10.1 has built-in voice recognition that really works. Even from the home screen, with no browser showing, you can touch the microphone icon, and say, for example, "Go to ConsumerWorld.org". The browser will pop open, and a second or two later, Consumer World's homepage is on the screen. Voice Actions can also be used to get directions, search Google, send an email (though not well), play music, and more. The unit also has two built-in cameras -- 3 megapixels facing forward (outward), with flash, and a 2 megapixel one facing you for video chatting (not tested). There are two tiny speakers, only about a half inch long on either side of the unit. Depending on the application, they may sound a bit scratchy, and not very loud, while on others the sound is just fine. The provided ear buds, however, provide excellent sound. You can connect the 10.1 to your computer via the provided proprietary USB cord in order to transfer files. But, it has no conventional USB port for a thumb drive or other device, there is no SD slot, and remarkably, there is no current way to print. (That latter feature may be included in a coming software upgrade.) You can only put icons for individual documents on your home screen by downloading a special file manipulation app; cut and paste is very clunky; some links or fields that should be clickable on websites are not; you cannot close most open programs -- they stay open, but not running [not true multitasking] -- so you can switch back to them; and some sites that play certain types of streaming videos (like Fancast.com) just don't work for all clips. All in all, despite those flaws that are probably Android issues, the Samsung Galaxy Tab 10.1, is a wonderfully elegant and functional tablet that should give the iPad a run for its money. The 16-gig wi-fi only model sells for $499, while other models will be priced higher. Consumer World�, launched in 1995, is a public service, non-commercial consumer resource guide with over 2000 links to everything "consumer" on the Internet. Edgar Dworsky, an avid bargain hunter, is the founder of Consumer World, editor of MousePrint.org � an educational site devoted to exposing the fine print loopholes in advertising, and a former Assistant Attorney General in the Consumer Protection Division of the Massachusetts Attorney General's Office.